with withdrawing life support. Yesterday, the issue of Nelson Mandela’s prolonged time on life support was criticised at a panel discussion hosted by Wits medical school by speakers both for and against euthansia. 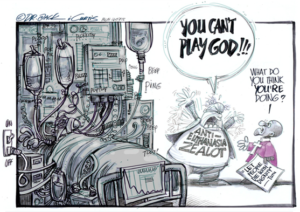 http://goo.gl/VOip60 An Eye Witness News cartoon frequently used by euthanasia activists shows former Archbishop Bishop Tutu accusing an ‘anti-euthanasia zealot’ of ‘playing God’ next to a man wired up to life support. http://www.dignitysa.org/blog/advance-directive/ This cartoon completely mis-represents the anti-euthanasia position and muddles the ethical issues. Eye Witness News has doubly violated media ethics firstly by misrepresenting the debate and secondly, by donating the original of the cartoon to the lobby group to sell to raise funds. News is supposed to factually correct and a neutral forum for debate. Life support machines are a form of “extra-ordinary care” which are given in emergency situations to give people short-term help in situations such as after motor vehicle accidents. There are no ‘anti-euthanasia’ leaders, in South Africa or as far as we know anywhere else in the world, who support their use to prolong the lives of aged terminally ill patients. This is just muddling the debate and mis-representing one side. “Extra-ordinary care” is unfeasible to give in the long term and has no benefit for terminally ill patients – rather they need ‘Palliative care’ which is helping them to die comfortably. Euthanasia and ‘assisted suicide’ is active killing. That is something completely different from withdrawing ‘extra-ordinary’ care. Judge Fabricius apparently can’t understand the difference.